One aspect of trading managed accounts which can cause a CTA endless headaches is the production of end of day trade files to the various administrators and back offices that are associated with the accounts. Each organization has their own “standard” file layout and unique requirements for both the file and how the information is to be transmitted. Add to that symbology and decimal point requirements and the situation can quickly get out of hand. TheBooks has a robust trade reporting facility which allows the end user to define file layouts and data transmission methods allowing the complete automation of this important operational function. You have just been given an allocation from a large fund of funds and they have specified that you must provide them a trade file at the end of each day that includes all trades done in their account. The file is to be sent via sFTP, use CQG symbology, and indicate trade changes from prior days by including correction, cancellation, and new indicators within the file. Associate the account(s) in TheBooks to the contact specifying the file layout defined in step two and indicating the frequency the data is to be sent. File layouts are also configured using the Configuration -> Counter Party option. Clicking on the Outbound Data Formats folder on the left portion of the window displays a list of available formats. We will be defining a new format, but to make things easy, we’ll start with an existing one as a model. Both the Action and AllocationRowID columns should be added to the file layout. This is done by selecting the columns in the left hand list of columns and clicking the include button. CQG should be selected in the Translate Market Symbols using this source combo box. The TranslatedMarketSymbol column should be added to the file because this is the name of the column that contains the CQG version of your market symbol. 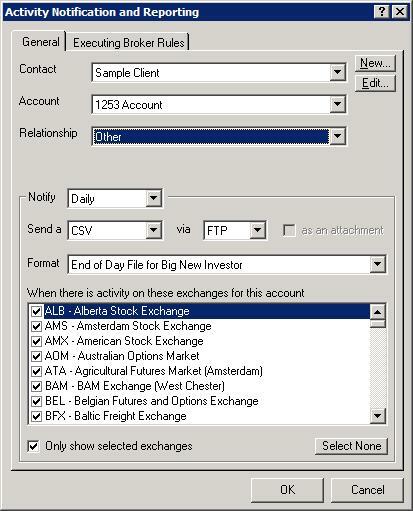 The Action column causes TheBooks to generate CANCEL/CORRECT/NEW items in the file enabling trade changes to be reflected in the file and the AllocationRowID column provides a unique number that the receiver of the file can use to associate changes to the trades. Once this has been done, give the file layout a name and the click OK to create it. The last step in the process is to link the account with the contact. This is also accomplished using the Configuration -> Counter Party option. Click on the folder called Contacts that receive trading activity and click on the New button. Select the contact and account from the dropdowns, select the Notify options to Daily, send a CSV via FTP in the new format you just defined and click OK.
That’s all there is to it. Now, at end of day, the client will automatically receive a data file of trades sent via sFTP containing activity for their account. Any changes to prior-reported trades will be noted within the file and the market symbols will be CQG symbols rather than the symbology you use. Providing customized trade files to investors, clearing brokers, 3rd party administrators, and others can be a daunting task for a CTA with managed accounts. For users of TheBooks, providing these types of files, customized to each recipient, is accomplished using a few, simple, configuration tasks.